Interlude: On the Differences between "What?" and "So what?" Chapter Five: What Do We Teach When We don’t Teach the Answer? Interlude: Why it’s a Good idea to Smack your Lips When the Lord of the Manor is Around. Interlude: Taking Measure of Things. 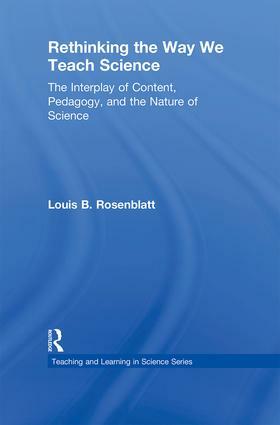 Lou Rosenblatt is a teacher with over 30 years of experience, chiefly at The Park School, but also at The Baltimore Freedom Academy, Johns Hopkins University, The University of Leeds, and Gallaudet College. He is a consultant with TIES, having worked chiefly with Baltimore City Public Schools and STEM schools in North Carolina. He has published several articles and presented at numerous conferences, and he was a member of the design team which secured funding from the Bill and Melinda Gates Foundation among others to establish The Baltimore Freedom Academy. The Teaching and Learning in Science Series brings together theoretical and practical scholarship emanating from a wide range of research approaches and paradigms on an equally wide variety of topics. International concerns about the quality of the teaching and learning of science continue to increase across countries, states, provinces, and local communities with each round of international assessments. During a period of expansive reform in science education, it is especially important that the most current research in areas of critical concern be synthesized for use by both practitioners and researchers.